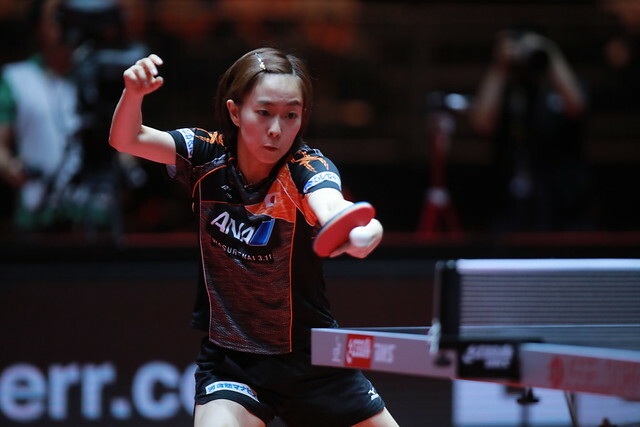 Giants fell and records were broken on Day Five at the Liebherr 2017 World Table Tennis Championships. Risk taker: Lee Sangsu (KOR) shook the world today when he defeated the two time World Champion, Zhang Jike (CHN) 4-1. With the score at 11-10 in the fifth, he served long. It worked, but what was he thinking?! 2 time World Champion Zhang Jike knocked out of #ITTFWorlds2017 by Lee Sangsu 4-1! ?? #WhoWillWin in #Düsseldorf? 1969: It is the year that man first walked on the . It was also the last time that Japan won a medal in Women’s Singles. With NASA announcing this year that they are planning to restart their lunar missions, it only seems fitting that Japan have secured a medal at the World Championships once again. 20 years on: Vladimir Samsonov has been a contender for the title for more than two decades. He came close in 1997, but he ran in to Jan-Ove Waldner in the final. Let’s be frank, with Zhang Jike out, that section of the draw has opened up, and Vladi looks ready to pounce at the opportunity to get back on the podium. He says he is back down to his Rio Olympics weight, and he is looking very relaxed on the table. But he is going to have to get through the giant killer Lee Sangsu. Simpatico: In Suzhou 2015, Mastaka Morizono and Yuya Oshima lost in the quarter-final of the Men’s Doubles to Xu Xin and Zhang Jike 4-3. The pair went down in the final game 12-10, after having multiple match points. Today they moved through the semi-final, and as number one seeds, are looking favourites for the title. Mima Ito and Hina Hayata also are in to the semi-finals. They became the youngest Japanese duo to do so when they beat Hong Kong’s Doo Hoi Kem and Lee Ho Ching in the quarter-finals. According to Mima they are twinning their way to the medal.